I’m absolutely loving this holiday season and all of the holiday themed layouts I’ve been seeing on social media! I have a festive layout to share with you today using the Ho Ho Ho Cut File from The Cut Shoppe. I tend to use a lot of my stash when scrapbooking any holiday themed photos. Mainly because I purchase so much each year but only use it for a month or so before it gets tucked away waiting another year to be used. The pattern papers I use for this layout are from Festivus, a Recollections paper pad I picked up a few years ago. I enlarged the Ho Ho Ho in Cricut Design Space and backed my photos behind two of the O’s. Before I adhered down the cut file I grabbed my No Yoking Coloringz from Shimmerz Paints and my brayer to apply a light coat of mixed media to the background. I really do struggle with traditional Christmas colors. Red and green isn’t an easy combo for me to use so I thought by bring in a little bit of yellow (which is a color I’m much more comfortable using) that it might help balance the color scheme and allow the design to come together a little easier. I grabbed multiple Christmas themed embellishments from my stash, including chipboard pieces from the Simple Stories ‘December Documented’ Collection, yellow buttons from My Mind’s Eye ‘Winter Wonderland’ Collection, and a glittery snowflake from Michael’s. I used a set of small black alpha stickers from my stash to add the “Merry Memories” subtitle. I also added my journaling using my We R Memory Keepers Typecast Typewriter. This layout is all about documenting a fun Christmas themed day our town hosted last year. Santa was there with one of his reindeer and the kids could pick out a book from the library. I also put together a process video including a Cricut Design Space tutorial. 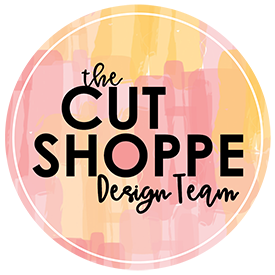 Thank you so much for joining me today and remember to head to The Cut Shoppe to check out all of the cut files and digital collections! You can save 31% now through December 31, 2016, so it’s the perfect time to stock up on the images you’ve been wanting all year long!